As a coach of a youth basketball team one of the most important things you can have handy is a play book full of plays that you know your team can learn! These plays should be simple enough for you to translate and advanced enough to push the players to learn, grow, and win more games. At Hustle we understand this and build our tools around your game. Here is a list of our favorites that we borrowed from other sites, but you can download our app for these and more. Our first several are borrowed from the Coaches ClipBoard and are all 3-2 Offensive Plays. 5) Ghost: “This play involves an up-screen for the guard leading to an open key. This can often lead to a simple pass inside and easy layup. If that option isn’t available, the post player sets a screen on the wing.” It requires the following players: “5 should be a post player or the best screener on the team. 2 should be the player you want dribbling in a pick-and-roll. 1 should have the ability to finish at the rim with pressure… The play begins in a 4-out 1-in formation with the 4 perimeter players above or in-line with the free-throw line… The play starts with the point guard (1) making the pass to 2 on the wing… As this pass is made, 5 sprints up and sets a strong screen on the back of 1’s defender as 1 cuts off the screen towards the rim. 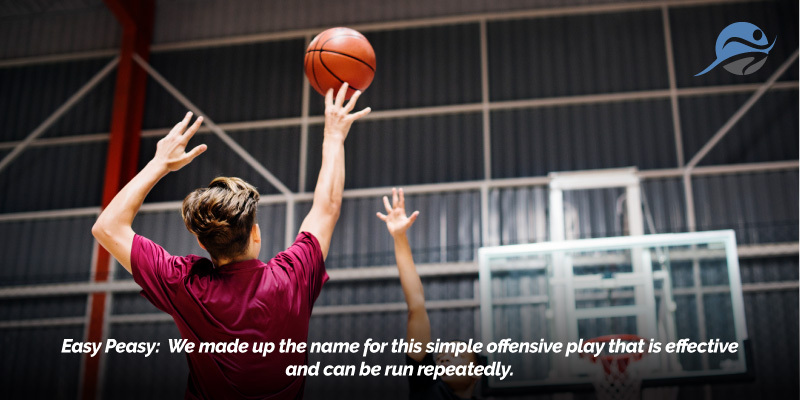 This next play is borrowed from Breakthrough Basketball and is one of the simplest to teach and run. For newbie coaches and newly formed teams that are not operating cohesively yet, try this to build everyone’s confidence. 7) Easy Peasy: We made up the name for this simple offensive play that is effective and can be run repeatedly. This requires your best team member 1, someone who “can handle the ball, drive, score, and pass… 2 & 3 - Good shooter than can be a threat from the outside. 4 & 5 - Someone that can rebound and make shots inside.” This play is made by putting the players into a low 1-4 alignment on the baseline. The best player (1) gets the ball. This would be above the top of the key. The shooters are put in position at the corners, to make their defense work harder. Player 1 then “create[s] and drive past their defender. From there, he/she just makes a good decision (shoot or pass to the open player for the shot).Many times Player 1 will drive to the basket, get almost there, and the help defense steps in. From there the point guard reads the defense and then kicks to a player in the corner for a wide open three. But sometimes your best player will get all the way to the basket for a layup or make a short dish to a post player for a layup. It doesn't get any simpler and we always get good shots from this play. The key is for Player 1 to make good decisions and kick it to the open player when the defense helps. It's also worth noting that if the defender stays low and helps, the wing should cut to the wing. If the defender comes up high to stop the ball, the wing should stay in the corner.